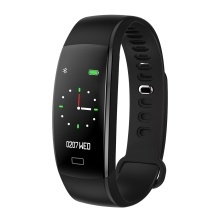 This smart Bracelet has sensitive touch screen and multi-functional application to provide a more health and more convenient life for you. Monitoring your sleep, distance, pedometer, heart rate, calories burning, blood pressure in real time. Helps you improve your life quality. You would not miss any important message through information synchronization and incoming call reminder. This wristband adopts skin-friendly, soft and comfortable TPU material, ergonomic design, chic appearance, multiple color option. Remove the wristband and plug it directly into the USB interface or charging the charging head, easy, fast and convenient. Achieved international IP68 waterproof rating, effectively eliminates the erosion of cosmetic, daily necessities, sweat and so on. Fits Androids 4.4 above and iOS 9.0 above devices, sensitive single-touch screen. Certified by BQB, CE, FCC, ROHS, support Bluetooth 4.0.